One of the most well-known and popular groups of items in the Albany Institute's collections are its Hudson River School paintings. And the museum recently put (almost) the entire collection on display. The Albany Institute has 92 such paintings from the famous 19th century art movement in its collection. And the new exhibit includes 83 of them. The remaining few are either on loan, currently getting conservation work, or otherwise not ready for exhibition. These landscapes, painted by artists like Thomas Cole, Frederic Church, Jasper Cropsey, Asher Durand, and numerous others, capture America's scenic grandeur in all its magnificence from rugged coastal scenery to imposing mountains and rivers. Many paintings in the Institute's collection depict the nation during decades of transformation from a country of small towns and farms to one of industrial works and sprawling urban centers. The nation was also in the midst of rapid westward expansion and political conflict that reshaped its social identity and cultural outlook. Developments in transportation allowed artists to travel more widely, frequently beyond the nation's borders, to Europe and more distant corners of the globe, and return to their home country with sketchbooks full of inspiration and new ideas. The paintings on view, therefore, reveal a visual history of the United States during the nineteenth century, including its aspirations and growing nostalgia for a simpler and more harmonious past. The paintings on are display in the large Hearst gallery upstairs and the look great. The walls of the space were repainted a deep red wine color for the exhibition, and the paintings -- and their frames -- really pop from the walls. The works also displayed at eye level or just below, which makes it feel like you can walk "into" the scene. 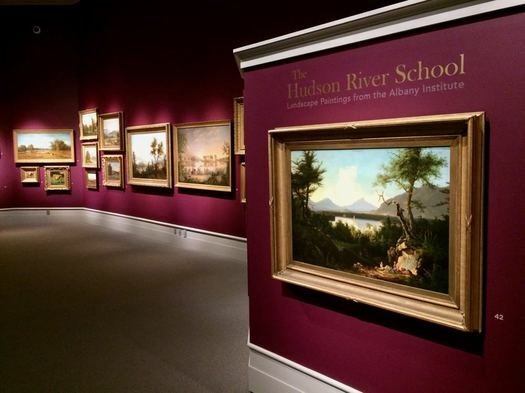 The Hudson River School exhibit will be on display for the next years at least. And the institute is also planning to publish a book that will include each of the works in its collection. 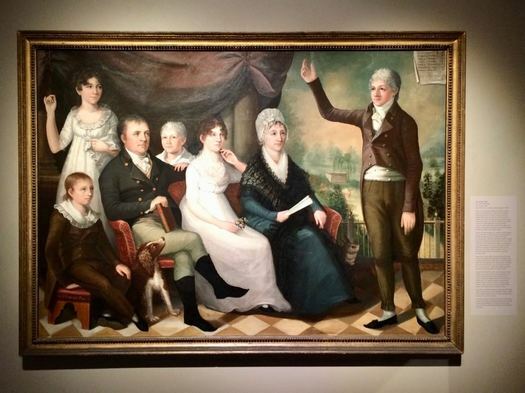 A portrait of the Fondey family by Ezra Ames from 1803. It's a fun, short exhibit. And it's in the small space leading into gallery with the Hudson River School paintings. The Fashionable Portrait will be on display through March 2018.